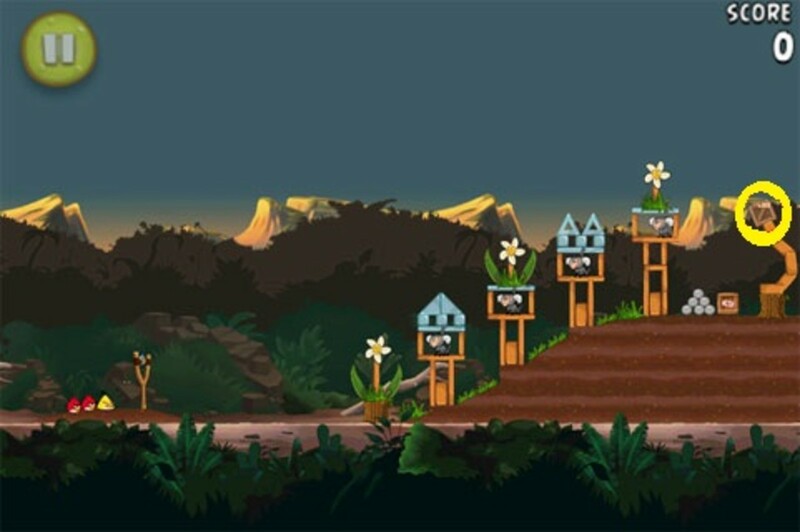 An increasing number of video games are moving in a narrative trend toward paternal surrogacy, wherein the player/protagonist cares for a child whose success represents success in the wider world of the game. In other media, the trope of a protective figure taking on the responsibilities of a guardian is well known with examples from Lone Wolf and Cub, to Les Misérables, to True Grit, to The Professional, to Wolverine of the X-Men and any number of young women who come to Xavier's Institute for Gifted Youngsters. 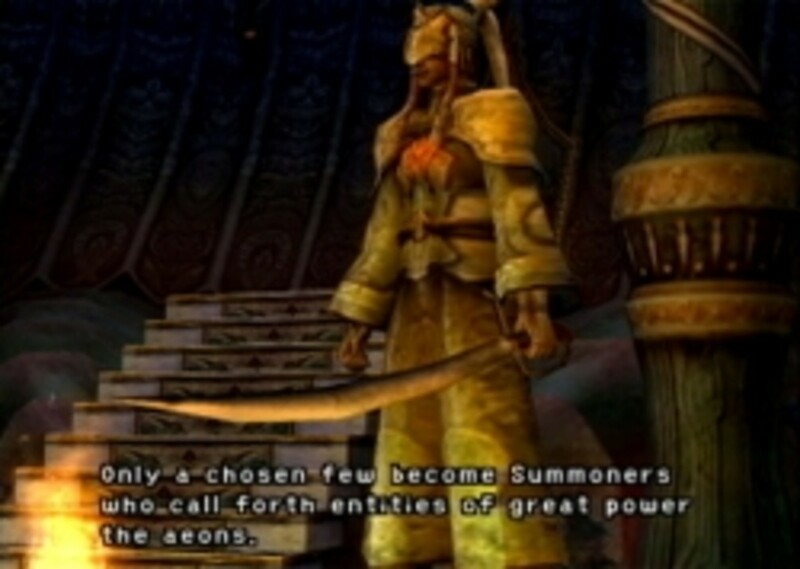 It is a standard bit as a storytelling technique, but it is relatively new and modern in video games. 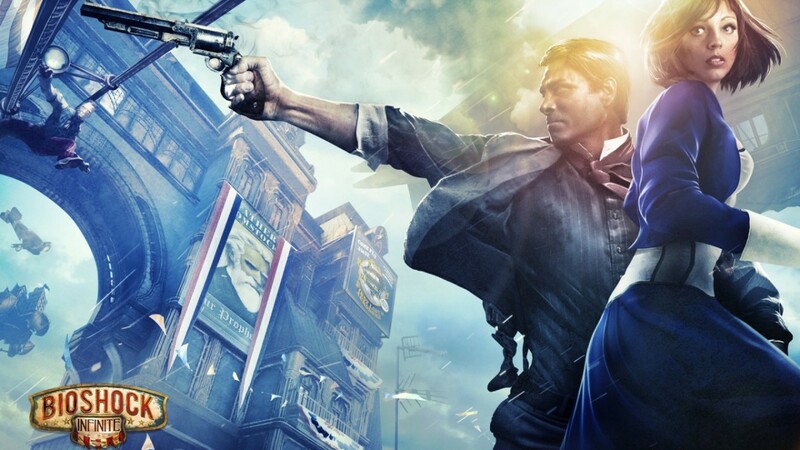 A pawn in an elaborate gambit that crosses parallel dimensions, Booker thinks only to rescue Elizabeth to “wipe away the debt,” but his experiences in Columbia prove there is much more going on. A man profoundly damaged by his violent experiences at home and abroad, Booker rescues Elizabeth only to quickly discover that she doesn’t really require his aide. 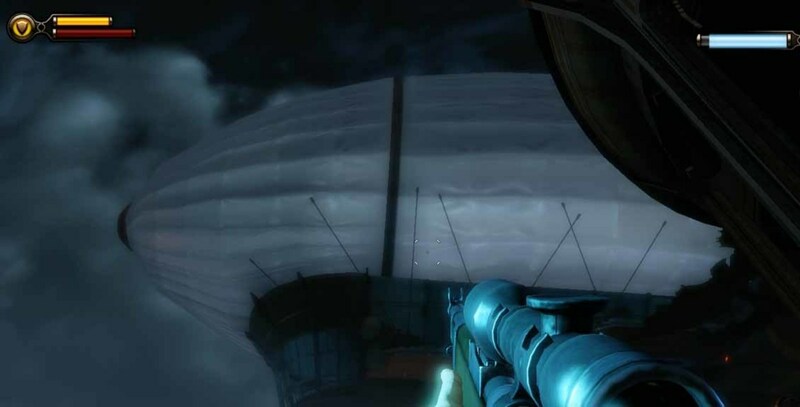 Lack of firearms training and worldly experience aside, Elizabeth is shown to be the real hero of Bioshock: Infinite as she grapples with her powers and the discovery of her true parentage. 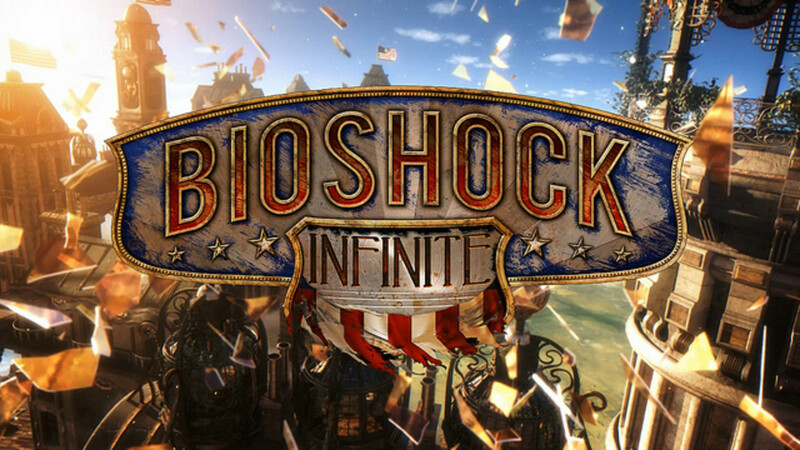 Witnessing this, Booker moves from seeing Elizabeth as a way to fix his own life to valuing her as a person with her own thoughts and desires. This revelation culminates, in a way, when he gives himself over to her hands, allowing her to put right, at some level, the chain of consequences that arose from when he gave her to the Luteces. 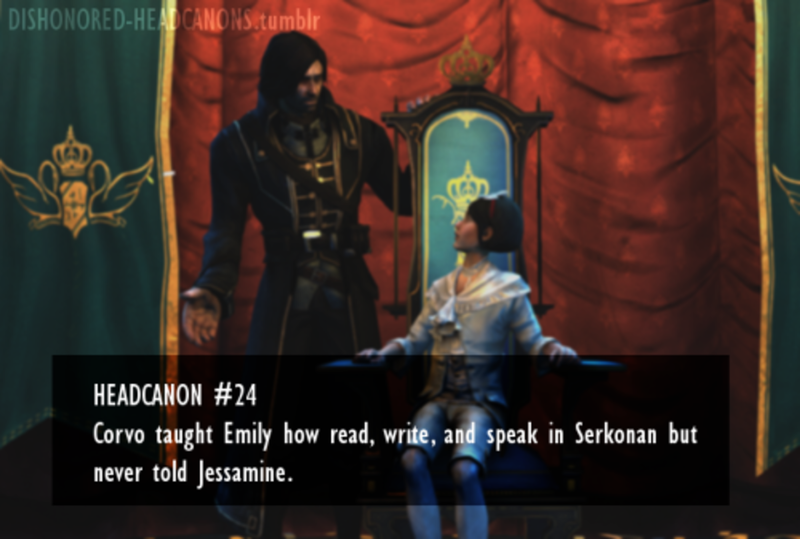 Corvo may be Emily’s father, but the player’s early interaction with her does not suggest a paternal role so much as a playful one. It is not until later, having rescued her in an attempt to restore her to the throne that Emily begins to watch Corvo in earnest as a model of behavior. This watchfulness plays into the ending of Dishonored, as it shapes the state of Dunwall. If Corvo was a vengeful killer who took lives as he chose, Emily becomes a young woman accustomed to violence and fearsome exercises of her power; if Corvo took pains to avoid violence and undid his enemies through stealth and other means, Emily develops into an enlightener ruler, known for thoughtfulness and justice. This arc in her can be seen in the game, too, by examining her drawings, whether they are pleasant or moody and frightening. In effect, Corvo’s effect on the future of Dunwall extends because of the way the player chooses to have Corvo conduct himself. If the player wants Emily to become someone who values human life, he or she has to show her what that looks like through conscientious actions. Clementine is almost totally helpless in Telltale’s Walking Dead’s zombie apocalypse because of her age. In saving her and trying to give her both survival skills and hope, Lee, who has no children of his own, take Clementine under his wing. Several characters even assume she must be his daughter (though that assumption carries an remarked upon racial component). Given his troubled and violent recent history, Lee’s caring for Clementine gives him the chance to redeem himself and perhaps by extension, what remains of civilization. 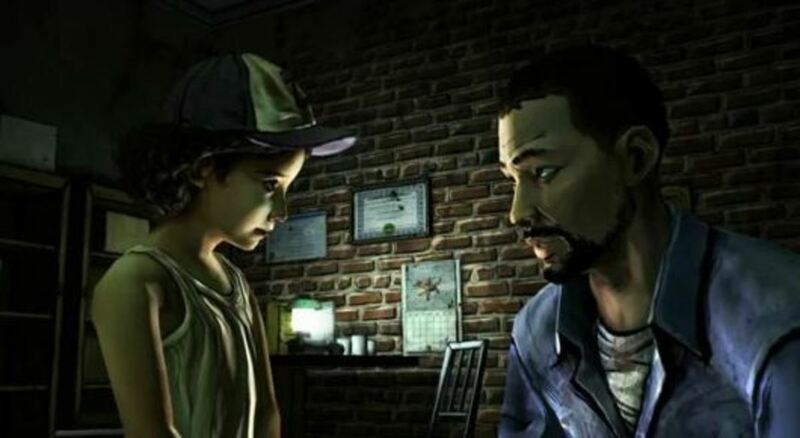 Clementine’s survival depends on Lee making the right choices and teaching her not just how to do so but why. The heartbreaking finale of season one showcases not just how much they needed each other but also the depth of affection they have. These feelings are reinforced in season two during Clementine’s dream sequence where the imagines Lee comforting her and giving her strength as her situation becomes increasingly perilous and trustworthy people exceedingly rare. The Witcher Geralt sets out to save Ciri from an interdimensional threat, the wild hunt, that has chased her for her whole life. As the game progresses, players see Ciri doesn’t exactly need him to save her but welcomes his help as a mark of his concern and affection. Her interactions with him reveal they have a profound relationship that extends beyond his training her. Though Geralt is not her father, he certainly treats her like she is his daughter as evidenced in his opportunities to continue her training, consoling her after tragedy, make her laugh, or reinforce her self worth especially when so many other characters see her only as a means to an end. What Geralt wants for Ciri is for her to grow, make choices on her own, and become the author of her own destiny, like any reasonable parent wants for his or her child. This sets him apart from virtually every other adult in her life. 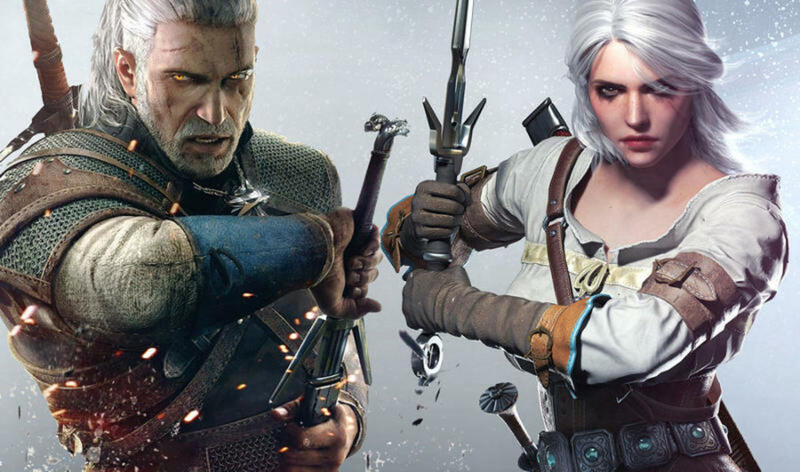 Much like with The Walking Dead and Dishonored, the choices the player makes as Geralt have a direct impact on actions Ciri takes toward the end of the game and is most clearly manifested in the epilogue “Something Ends, Something Begins.” Ciri’s future is a result of what the player has done, not as a killer of monsters, but as a guide and decent human being. The importance of having these storylines occur in games is multifaceted. At the most obvious, the central narrative gets a time-tested structure upon which the action of the game can hinge. At a deeper level, this design put relationships at the center of gameplay, especially with Telltale’s Walking Dead and Witcher 3: Wild Hunt, where the players make choices in shaping those relationships. Success or failure is not just chalking up kills or solving puzzles but also building trust through choosing to value others as evidenced by the player’s words and actions. 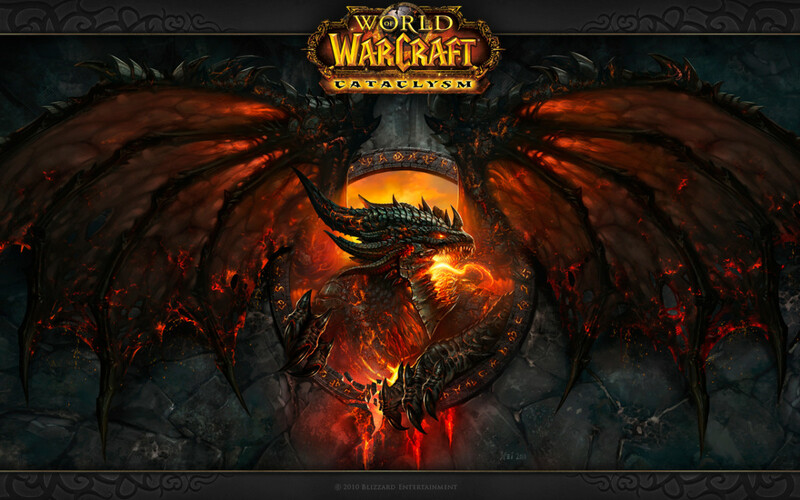 Additionally, having another character to care for is a way into humanizing a protagonist. The lead characters of all these games could come across as monstrous, but in watching them genuinely care for someone else, the player is invited to see them as more complex than the unreflective and unconnected leads of other titles. This paternal relationship was not often seen in games, suggesting designers and publishers are aware not everyone buying their products are sixteen years old boys or people solely in need of escapist power fantasies. In a previous editorial by Ben “Yahtzee” Croshaw, he wonders at why an increasing number of video game protagonists were becoming dads, and describes that it must result, in part, from an expanding player base who want to see characters a bit more like themselves. With any luck, this trend will continue, leading not only to additional, interesting narratives but also to more diverse and worthwhile protagonists. 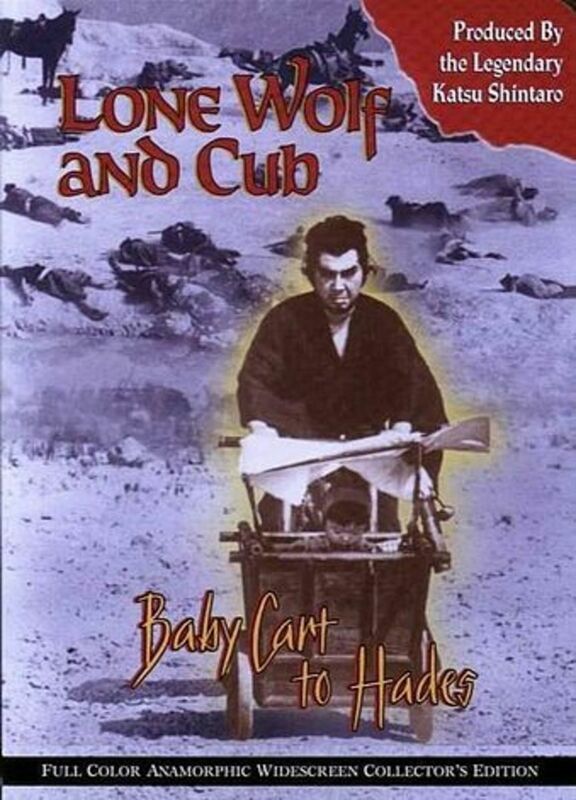 If nothing else, these lone wolf and cub relationships in games means is that developers are at least trying to put human relationships in a central position even in games that are ostensibly action-oriented, such as Dishonored and Bioshock: Infinite. This hub was written for Critical Distance and its series Blogs of the Round Table, and others in the June series can be found by following this link.